Check out these gorgeous Chinese crystal rondelle beads and rhodium crystal balls that I received from Auntie's Beads recently! 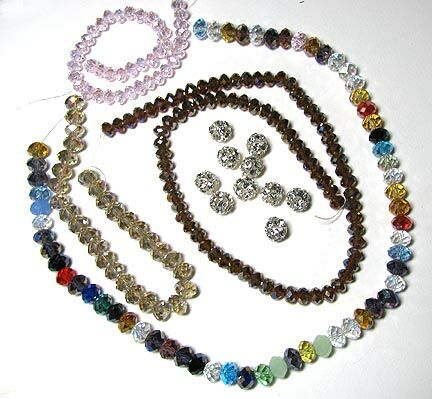 Chinese crystal is intended to give a less expensive alternative to Swarovski crystals without sacrificing sparkle. They are extremely pretty and sparkly, expecially the ones that have the aurora borealis finish (designated AB below in the list of specific beads). I particularly like the crystal silver and the crystal copper, and I'm trying to figure out a project that will combine them. They both have layers of color, which changes as the light moves over them. I'm a big fan of the rondelle shape too, so I'm really happy that was the shape chosen for this review package! Stay tuned...a project will be along shortly, I hope! As regards FTC disclosure guidelines: I have received all of these beads free of charge from Auntie's Beads in order to write a review and/or create a project free of charge for you. I have not been paid for my endorsement as it pertains to the products received. Ah, so that's what they are! I got a strand of these (opaque pastel colors) from a local bead shop; the lady working at the counter didn't seem to have any details on them. Yes! They are gorgeous; don't you just love the clarity in the translucent ones? I just love the chinese crystal. I am actually finding in a lot of case that I prefer it over swarkies. Now if only the customers would agree. Well, I certainly prefer the prices!